Billy Graham became known as "America’s pastor" by refusing to pick a political side while reaching out to other religious leaders and invoking “the Lord” rather than Jesus. But his son, the Rev. Franklin Graham, isn’t practicing what his father preached. While the elder Graham, who died Wednesday at age 99, prayed with Democratic and Republican presidents, Franklin Graham has aligned himself with archconservative Republicans and is squarely in President Donald Trump’s corner. Franklin Graham even took a page from Trump and coyly questioned whether President Barack Obama was Christian, although he later apologized for doing so. Billy Graham largely left the culture wars to combative conservative evangelicals like James Dobson, Jerry Falwell and Pat Robertson, but his son has not hesitated to level threats of hell fire against gay people, tarring them as sinners and followers of Satan. Both Grahams opposed homosexuality, but while Billy Graham was apologetic after he suggested in 1993 that AIDS was "a judgment of God" and afterward largely steered clear of the subject, Franklin has not held his tongue. Billy Graham was, for the most part, respectful of other religions — although he did face criticism in 1994 after he was quoted in the posthumously published diaries of H.R. Haldeman, President Richard Nixon's chief of staff, as having said in 1972 that "satanic Jews" dominated the news media. After first denying the quotes, Graham apologized in 2002 when audio of them surfaced, and said his remarks did "not reflect my love for the Jewish people." His son, meanwhile, has flat out called Islam “evil and very wicked." To other experts, what Franklin Graham represents is a return to the harsher old time religion that his father did not push, one that excludes non-Christians and insisted that salvation is only for those who accept Jesus as their savior. Franklin Graham, as a young man, rebelled against his father before returning to the fold, Balmer noted. “I think people who do that kind of thing tend to be more conservative and more willing to impose strictures on both themselves and on others,” Balmer said. Also, Franklin Graham’s ascent coincided with the rise of the "Moral Majority" and the migration of evangelicals from the Democratic Party to the GOP. Franklin Graham has chosen to do the opposite, Hankins said. 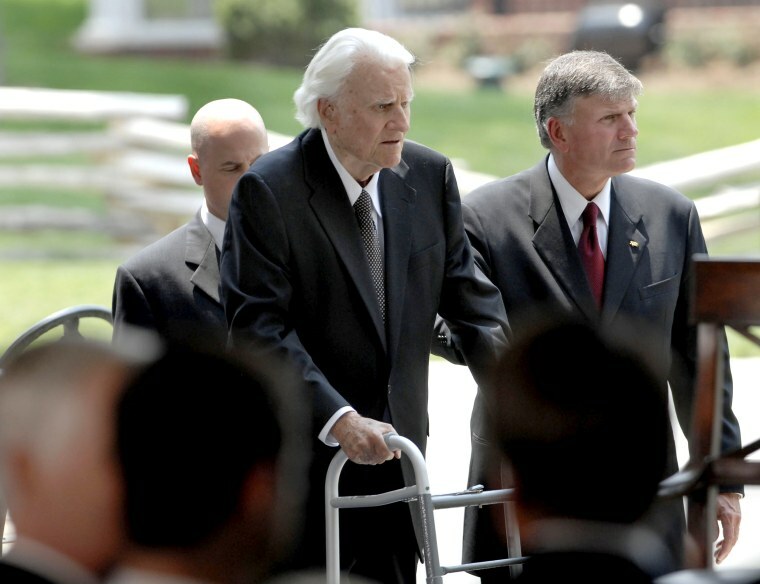 If Billy Graham had any qualms about his son’s approach, they were never aired in public, Wills said. Franklin Graham did not return an emailed request for comment sent to the Billy Graham Evangelistic Association.